How Popular is Your Fraternity? Fraternities have existed on American college campuses since the nation’s founding. By mapping thousands of chapters across 794 campuses, we determined which fraternities are most common in each state. Alpha Phi Alpha, which was founded at Cornell in 1906, has at least 290 active chapters, more than any other fraternity, according to data available on GreekRank.com. Kappa Sigma dominates the South and Northwest. It is the most common fraternity in nine states. 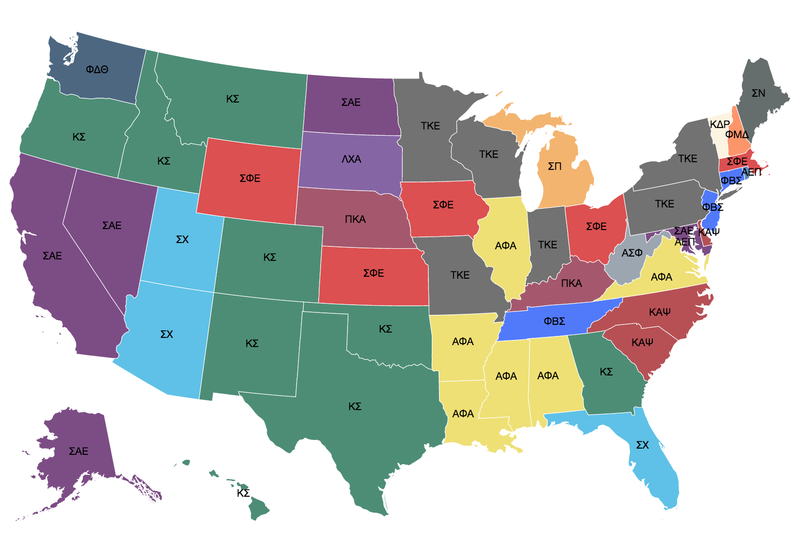 Tau Kappa Epsilon and Alpha Phi Alpha–a historically African-American fraternity–tie for second place, each taking six states across the eastern U.S. Sigma Alpha Epsilon’s dominance in the West comes into sharper focus when searching for the fraternity’s chapters. GreekRank–a site that ranks fraternities and sororities–provides active chapter locations for 80 social and professional fraternities across 794 colleges. No other aggregated data is publicly available on fraternities. Chapter locations published on fraternity websites report suspended and inactive chapters inconsistently, and membership numbers are even harder to locate, making anything beyond a geographic comparison difficult. Active chapters are aggregated by state to determine winners. When fraternities tie for chapter numbers, like in Alaska with fewer campuses to extend influence, the most senior fraternity takes first place.